Atheist Law Student Hacked To Death In Bangladesh : The Two-Way Last year, a string of attacks killed secular bloggers in Bangladesh. Now 28-year-old Nazimuddin Samad, an outspoken atheist, has been killed, reportedly by several unidentified assailants. 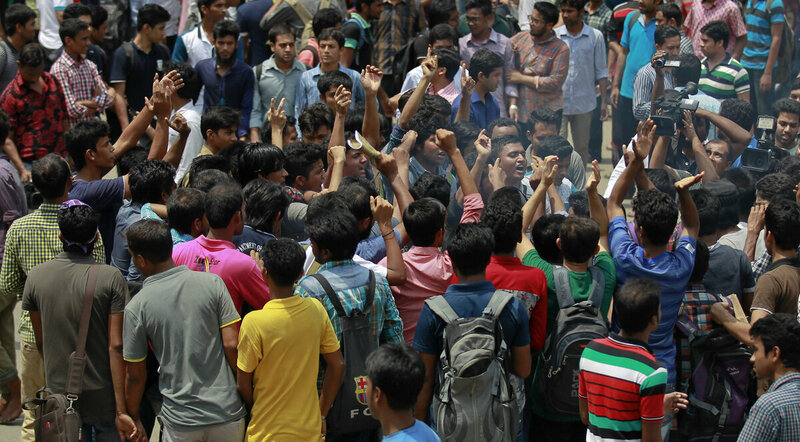 Bangladeshi students protest on Thursday, seeking the arrest of three motorcycle-riding assailants who hacked and shot student activist Nazimuddin Samad to death as he walked with a friend in Dhaka, Bangladesh. A 28-year-old atheist law student has been killed in Bangladesh. The attack follows a string of murders last year targeting outspoken advocates of secularism. Nazimuddin Samad, a student at Jagannath University, was hacked and shot on Wednesday night while he was walking in Bangladesh's capital, Dhaka, The Associated Press reports. Multiple attackers, who were reportedly riding on a motorcycle, have not been identified. They escaped while praising Allah, according to the news service. "A supporter of Prime Minister Sheikh Hasina's secular Awami League party, Samad also took part in the movement that successfully pushed for prosecutors to have more scope for going after suspected war criminals." The Dhaka Tribune describes him as an activist with that movement, which is called Ganajagaran Mancha. The perpetrators and the motive haven't been identified by police, the BBC reports. Last year, at least four secular bloggers were hacked to death in Bangladesh and a publisher who worked with one of those bloggers was stabbed to death. After one of those murders, the editor of the Dhaka Tribune, Zafar Sobhan, spoke to NPR's Robert Siegel about the rising tensions between secularists and Islamists in Bangladesh. "Recently, over the last couple of years, we have had war crimes trials in Bangladesh. This is to do with our War of Independence in 1971," Sobhan said, referring to the trials that Ganajagaran Mancha had successfully advocated for. "Most of the people who have been put on trial are Islamists ... who were collaborating with the Pakistan occupation army back in 1971. Now, war crimes trials are very important. However, I think the downside is that they have been painted as a movement against religious people, against Islamists. "So I think as a result, those who are of a religious bent feel targeted. I think they feel as though they are on the defensive. And so they have decided to step up their opposition and step up their campaign of terror and violence." The government of Bangladesh — which is officially secular — has been criticized for failing to protect prominent secularists. Last May, Rafida Ahmed, the widow of one of the bloggers, spoke to NPR's Rachel Martin about the attack. Ahmed was injured in the attack that killed her husband. "You can do very little when your elected government doesn't give you any support, especially when these kind of brutal murders are happening," she said. "The government has stayed completely quiet about this. The prime minister called my father-in-law privately and tried their best to keep it a secret so that nobody knows that they have sympathized with us at all. "The prime minister's son ... gave an interview to [the press]. Pretty much said that they are walking a fine line, and they're scared. They don't want to side with the atheists," Ahmed said. After the attack on Samad, the director of public policy at the Center for Inquiry, a U.S.-based secular advocacy group, called the murder "heartbreaking and maddening." "The government of Bangladesh must do much more to protect its own people from marauding Islamist killers," CFI's Michael De Dora said in a statement. "These murders keep happening because they are allowed to happen."